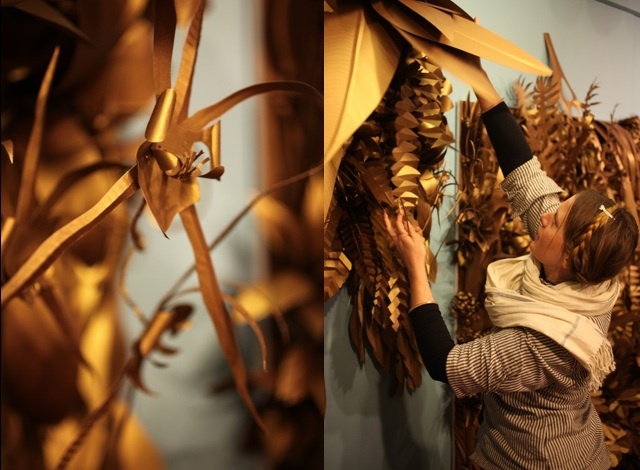 The lovely and talented Johanna Burke recently designed and constructed this fantastic golden jungle of intricately cut paper for a client who wants to install it as a display in his luxury goods store in Korea. These pictures show the three giant panels in progress in her Dumbo studio. It took many hours and many pairs of hands to cut out the intricate orchids, monsteras, passion flowers, Venus flytraps, and palm fronds that make up the vertical garden (she also has talented friends with good scissor skills). The pieces were shipped to Korea and I hope to have an update on the finished piece to show you soon. Johanna also worked at Bergdorf Goodman for several years and helped design some of their most notable holiday windows. Notice how nicely her hair matches the reflective golden tones of the paper. She's very visual. Update: My friends at Supernaturale just picked up this story. Check out their wonderfully crafty world here. Update2: The wonderful Grace Bonney at designsponge.com has picked up and commented on this story as well. I love it! How can I reach Johanna? Brilliant! Inspiring! Makes me itch for some scissors and paper! Great blog! Thanks for letting me know about it. Problem is that I'll probably be spending way too much time on it. Hope you'll be posting about your garden, too! This is completely stunning and inspired. Would LOVE to see in person. Love the hedge art and the golden paper hanging jungle is fabulous. stephen! it's jenny kim from the domino days. :)hope you're well! i was just on designsponge and read about this. i'm curious what store the display was made for because i think i may be going home to korea at the end of april. it would be amazing to see johanna's work in person! Hi, I am the architect who, along with my brother John, designed the store that Johanna Burke and Demetrios Argyropoulos so beautifully elevated with the vertical garden. The store is Nancy Gonzalez, a handbag boutique located at the Galleria Shops in Seoul. I expect to have professional photos in a week or so and will send them your way. Thank you Christopher! I would love to show the finished picture in a new post when you get it. I was waiting to include all your details for that post when more people can see it not that it's not a secret project.